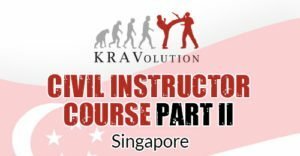 If you want to become a Krav Maga Instructor, sign up now and improve yourself. The goal of our Krav Maga course, which is with over 170 h full-time training one of the most complete and most extensive ones in the whole system, is the deployment of qualified instructors in our instructor team as well as the deployment as Civilian Krav Maga Instructor internationally. • An unprecedented level-testing, where your ability to teach is as important as the right performance. Here you are not tested by one single examiner, but by a testing-committee. Previously it consisted of several active Krav Maga instructors. After your payment you will get an confirmation eMail with all the details you need to know to the course.